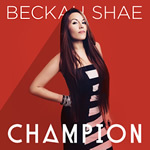 Given that Beckah Shae has guested on albums for friends such as TobyMac, Montell Jordan and T-Bone in recent years, it’s only fitting that some of them return the favor on her latest. The seasoned, soulful vocalist recently released Champion, her eighth album, featuring exciting collaborations with Israel Houghton, Crystal Lewis, and T-Bone, among others. Not that Shae needs any help, musically speaking. The dynamic vocalist released an album a year over the last half-decade, and Champion is another hip-hop/dance-flavored project that audiences and critics will undoubtedly enjoy. We recently had the chance to ask Beckah about her creative process, ministry and longevity in the business. CCM: Eight albums in, are you surprised that you’re still making music long after most artists have moved on to other careers? BECKAH: It’s always been much more than a career for us. Songs and singing for me have been the way that I communicate to God and express what’s being poured into my spirit. Singing is what has gotten me through some of the loneliest and toughest times of my life from childhood until now. It is something that I was created and called to do, whether or not it seems successful to others. I do not define my success by the opinions and expectations of people but by the opinions and expectations of God. What’s so fascinating is that as genuinely authentic and relevant as this music is to my life, its relevance reaches right into the lives and hearts of so many others. We will never stop doing what we are doing, simply for the fact that we know this is what God has called us to. CCM: This makes four albums since 2010, as well as a Christmas album. It seems like you’ve enjoyed a prolonged fruitful period as an artist. Does it feel that way? BECKAH: I’m always thinking of planting seeds. We can’t always wait around for the fruit. Growing takes time. So in the meantime, I continue to plant! It keeps me busy. I have two young daughters I’m building a legacy for. They continually inspire me to make the most of my time. We’ve got several projects already mapped out for the years ahead! I don’t count on seeing the fruit. I just try to stay focused on being grateful and faithful. CCM: Can you take us into the process of where the songs are coming from these days? BECKAH: Every song, every album I’ve ever made, has been a clear reflection of the journey I’m on in that season. These days I feel like I am in desperate need of keeping focused on the “Pioneer” and “Champion” of my faith more than ever. When I look around I see a majority clinging to conformity. It is very difficult these days to stand up, stand out and stand firm. Most of these songs are about keeping an eternal perspective, braving the unknown and finishing strong. VISIT BECKAHSHAE.COM FOR MORE INFORMATION.